As we all prepare for Christmas at home, we plan for a day of fun and laughter, food and drink as well as presents for all. We enjoy time to relax with our families, watch some festive TV and share the magic of seeing our children opening presents. But, if most of us are honest, we probably take some of these special moments for granted. “My name is Helen Lingard, I am 41 years old and I live with my two children Brett (13) Molly (7) and my fiancé Jamie who has a son Ben who’s 11. I’m a student paediatric nurse in my third year of training and had just started my final placement at the beginning of September on the neo natal ward at Barnsley hospital. I’m usually very fit and well, I usually go to the gym regularly, but life was pretty busy with placement, so I wasn’t going as much as usual. Because of this, the kids and the long shifts, I didn’t think much of it when I started to feel tired. Over the next few weeks though it gradually got worse and I found myself very short of breath and my heart racing, I struggled to walk up the stairs, I was also having high temperatures. On the 5th October I went to the out of hours doctor at Doncaster hospital who ran blood tests, I was devastated to be diagnosed that day with acute myeloid leukaemia. My first thought was I wouldn’t see my children grow up. I was admitted and given a blood transfusion straight away, the first of many! Two days later I had a bone marrow biopsy and started chemotherapy. Initially I felt ok although my temperature remained high, I had an infection but due to the leukaemia it was vital to start chemo straight away alongside antibiotics. As the week went on it became more difficult to breathe and I was given oxygen. On the final day of chemo, I went downhill, and my oxygen levels dropped, I was transferred to intensive care where I was intubated and ventilated, I had pneumonia and neutropenic sepsis. I remained fully ventilated for three weeks. On coming around, I had a tracheostomy, I had no muscle strength and could barely do anything for myself. I remained on intensive care for a further two weeks until I was weaned off the ventilator and the tracheostomy was able to be removed. During my time on the unit I didn’t feel it was the right environment for my children to see me in, especially Molly as she’s so young, so it was nearly six weeks until I saw them. They handled the situation so well, they didn’t miss a day of school and stayed with my fiancé and their grandparents, never complaining. They were so brave, I’m so proud of them! The support from my family was amazing. As I became stronger, I was allowed home for a week to spend time with them but I’m back in hospital now having just completed my second cycle of chemo. I have to stay in hospital, so the kids are away from me again for another month potentially. I’m hoping to spend some time with them at Christmas…which is just around the corner! 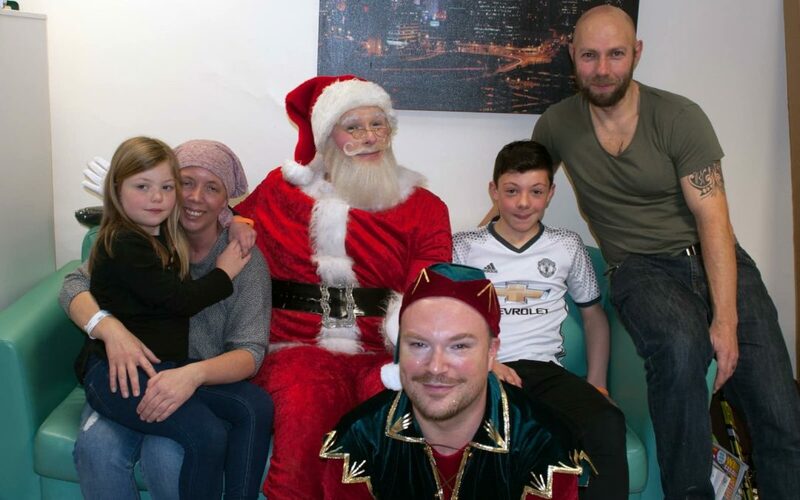 As Helen said at the end of her story, we were lucky enough to arrange for Santa to visit Helen and her family at her hospital bedside. If she can’t be home for Christmas, we’ll take Christmas to her. In true Santa Claus tradition, he brought presents for the whole family, allowing Helen, Jamie and the children to enjoy the magic of Christmas together, in the face of such adversity. Helen watched the children open their presents, she saw the magical smiles and they were able to share their joy with their mum. Santa (James Worthington of Talegate Theatres and “Father Christmas Needs a Wee” production) was assisted by his head elf (Phillip Ward) and the EvesTrust team. They managed to surprise everyone with gifts they really wanted……..
13yr old Brett is an inline hockey player who is hockey stick mad…. He received a new Bauer Supreme 25. He also enjoys building airfix models, so has a helicopter model and a JD Sports gift voucher. Ben (Jamie’s son) asked Santa for some electric table top drums, led drum sticks and a beginner’s book…. Santa obliged. 7yr old Molly asked Santa for a bike………she received a new bike and helmet, she also loves craft, so she received a box full to work through while visiting Mum. Then there was Helen and Jamie…. we couldn’t forget about them. Helen and Jamie’s hobbies are the children and their love for Sheffield Steelers. So, with the help of the Steelers organisation & Mike O’Connor, Santa presented them both with the new range of Sheffield Steelers team jackets, a VIP day with the Steelers themselves and £250 worth of team merchandise for the whole family!! The gifts didn’t stop there as Amy from “The Entertainer” in Doncaster, donated a gift voucher so we could buy a family game for them all to enjoy over Christmas. All in All, Helen and her family were able to enjoy Christmas, together, and in the face of Cancer and all their obvious fears. They smiled, they laughed, and they played games together, something they feared they may have struggled to do.